Fernhill Glass hopes you have a great day! Fernhill Glass Studio is excited to now offer a "Blow your own Floats, Ornament or Pumpkin" with the help of the artist. 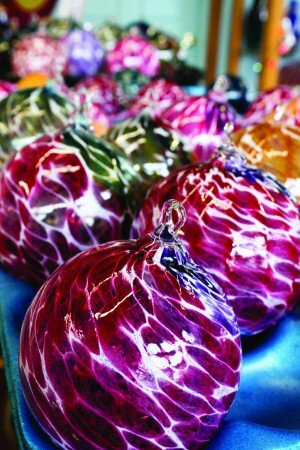 You will pick out the color combination & assist the artist in creating a one of a kind glass ornament, Floats or Pumpkin. Classes usually last about 15-20 minutes. Blow your own Ornament is $40.00 per person. Blow your own Float for $65.00 per person. Blow your own Pumpkin for $75.00 per person. You should call ahead for a scheduled appointment but walk-ins are fine, but please note, there could be a short wait. Pick up will be the next day as the glass must anneal over night. Please call 503-325-3448 or 503-421-4004 to schedule a time. Paperweight making classes are usually about a hour long and are more hands on. 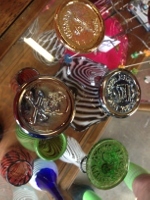 Paperweights are $65.00 per person. Pleae call ahead for this longer more involved classes. Fernhill Glass Studios© 2018. All rights reserved.